The EM Data Bank (EMDB), the primary archive for experimentally-determined maps obtained using three-dimensional electron microscopy methods, will join the PDB archive (ftp://ftp.wwpdb.org) on 7 March 2012. The merger marks an important milestone in the Worldwide Protein Data Bank's mission to maintain a single public archive of macromolecular structural data from all structure determination methods that is freely available to the global community. The PDB currently has over 77000 coordinate entries, nearly all with associated experimental data, including 57000 X-ray entries with structure factor files and 6400 NMR entries with restraints. The merger will join all 3DEM results into a single archive, including over 1200 electron microscopy derived maps currently held in EMDB with coordinates for 400 EM map-derived models in PDB, and is an essential step in the wwPDB's development of a Common Deposition & Annotation Tool that will cover all experimental methods, including hybrid methods. With the addition of EMDB data, the physical size of the complete wwPDB archive will jump from its current 130 GB to roughly 180 GB. Sites that mirror the full wwPDB archive will need to increase storage capacity accordingly. The main impact for 3DEM data users will be the change in download links for maps. However, 3DEM depositors will not be directly affected--map and model deposition sessions should continue to be initiated from EMDataBank. All 3DEM map depositions will continue to receive EMDB IDs and all 3DEM coordinate entries will continue to receive PDB IDs. The Worldwide Protein Data Bank partners are organizations that act as deposition, data processing and distribution centers for PDB data. The founding members are RCSB PDB (USA), PDBe (Europe) and PDBj (Japan). The BMRB (USA) group joined the wwPDB in 2006. The EMDB was established in 2002 by PDBe at the European Bioinformatics Institute, and is currently operated by EMDataBank, Unified Data Resource for 3DEM, established in 2007 as a joint effort of PDBe, RCSB PDB and NCMI. EMDataBank will continue to serve the 3DEM and wider scientific communities with its 3DEM-specific portal for deposition and access to EM-derived structures with links to software, validation standards and conventions. Summary information regarding the merger and detailed specifications for data access will be posted at EM Data Bank part of PDB Archive. Celebrate four decades of innovation in structural biology with the wwPDB October 28-30, 2011 at CSHL. View the updated program (PDF from 10/24) and poster abstracts (PDF). Limited space is available--register today! The Worldwide Protein Data Bank (wwPDB; wwpdb.org) is pleased to direct PDB depositors and users to the recommendations of the wwPDB X-ray Validation Task Force (VTF) that were published in the journal Structure this week (2011, vol. 19: 1395-1412). The wwPDB X-ray VTF was convened in 2008 to collect expert recommendations and develop consensus on validation methods that should be applied to crystal structures (models and data) in the PDB and to identify software applications to perform these validation tasks. These recommendations are the basis of a new validation suite that will be part of the new Common Tool for Deposition and Annotation (D&A) that is currently being developed by the wwPDB partners. The D&A tool and the X-ray validation pipeline will go into production by the end of 2012 at all wwPDB deposition sites (RCSB PDB, PDBe, PDBj and BMRB). From that moment in time on, depositors of X-ray crystal structures at the PDB will be provided with a detailed validation report. Such reports can be submitted to journals to accompany manuscripts describing new structures, and several publishers are working towards making such reports mandatory. Once the D&A tool is in production, the wwPDB partners also plan to provide the validation pipeline as a server, allowing crystallographers to assess their models before deposition and publication. Additional VTFs have been convened for NMR (by wwPDB) and 3DEM (by EMDataBank). The wwPDB greatly appreciates the efforts of the authors of the X-ray VTF report: Randy J. Read, Paul D. Adams, W. Bryan Arendall III, Axel T. Brunger, Paul Emsley, Robbie P. Joosten, Gerard J. Kleywegt, Eugene B. Krissinel, Thomas Lütteke, Zbyszek Otwinowski, Anastassis Perrakis, Jane S. Richardson, William H. Sheffler, Janet L. Smith, Ian J. Tickle, Gert Vriend and Peter H. Zwart. Depositing a protein-protein, protein-DNA, protein-RNA or protein-peptide complex? Consider submitting your structure as a target for CAPRI after depositing your entry to the PDB. CAPRI (Critical Assessment of PRedicted Interactions) is a community-wide, double-blind experiment aimed at assessing the performance of protein docking algorithms. Submitting a target to CAPRI will help advance protein methods calculations, may provide new information on the quaternary structure of your complex, and should increase the visibility of your work. Moreover, CAPRI is designed to maintain strict target confidentiality, and imposes little delay on its publication. More information about target submission is available at the CAPRI site and from the CAPRI management team (joel.janin@u-psud.fr). In October 2011, the wwPDB will host a scientific symposium at Cold Spring Harbor Laboratory (CSHL) to celebrate the PDB's 40th anniversary and the many scientific contributions it archives. This event will begin with an evening reception, dinner, and oral session on Friday, October 28th and conclude with lunch on Sunday, October 30, 2011. The anniversary symposium will overlap with the last weekend of the CSHL course on X-Ray Methods in Structural Biology, whose faculty and students are anticipated to attend the celebrations. Limited space at PDB40 is available--register today! 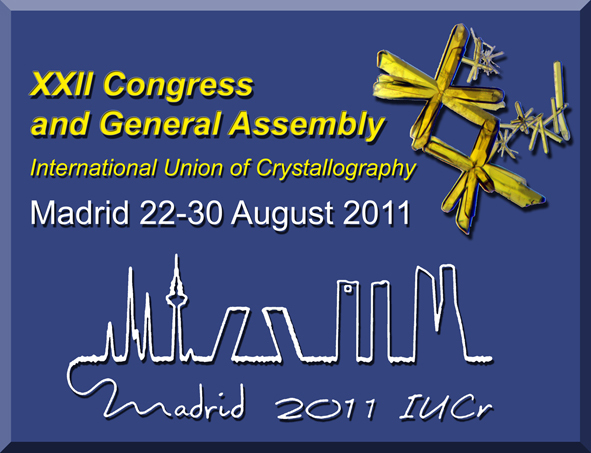 Meet wwPDB directors and staff from around the globe at the XXII General Assembly and Congress of the International Union of Crystallography (IUCr, August 22-30, 2011) in Madrid, Spain. wwPDB Q&A Session (Thu Aug 25, 1:40 - 2:40pm). Come to Room Paris for an open discussion with the wwPDB directors about issues important to you and the PDB. RCSB PDB Director Helen M. Berman will discuss The wwPDB and future perspectives in sharing macromolecular structure data as part of the session Developments and directions for crystallographic databases (MS27 Wed Aug 24, 3-5:35pm), chaired by RCSB PDB's Senior Software Architect John Westbrook and Saulius Grazulis (Vilnius University) in Room Londres. In Friday's Keynote Lecture 16, Gerard Kleywegt (Head of PDBe) will address Validation and errors in protein structures (Fri Aug 26, 9-9:50am) in Auditorium A. Later that morning, Swanand Gore (scientific programmer, PDBe) and Marina Zhuravleva (annotator, RCSB PDB) will describe Validation of small molecule and macromolecular X-ray structures. What are the differences and how can we learn from each other? together with Matthew Lightfoot (CCDC) as part of the session on Validation, error detection, and fraud prevention (MS43 Fri 43, Aug 26, 10:15am-12:50pm) in Auditorium A.
John Westbrook will present The wwPDB Working Format: A simplified application of CIF technology on Monday as part of the COMCIFS session (MS89 Archiving, exchange and retrieval of scientific data in the 21st century, Mon Aug 29, 10:15-12:50) in Room Londres. Learn about The wwPDB Common Tool for Deposition and Annotation as presented by RCSB PDB Deputy Director Martha Quesada on Tue Aug 23 and Wed Aug 24 (MS27.P02(C403)). During the poster session on Sat Aug 27 and Sun Aug 28, PDBj's Akira Kinjo will describe the Protein Data Bank on the semantic web (MS89.P01(C760)). Visit the wwPDB exhibit booth for demonstrations, conversations, materials, and more. Celebrate four decades of innovation in structural biology this fall at a Cold Spring Harbor Laboratory symposium honoring the PDB's 40th anniversary and the many scientific contributions it archives. Limited funds are available to help students and early career scientists attend PDB40. Preference will be given to those who have submitted poster abstracts. To apply for assistance, download the application form from the PDB40 website, and email the completed form, a copy of your abstract, and a supporting letter from your research advisor/department chairman to info@wwpdb.org. Funds are non-transferable. Awards will be distributed after the meeting. Applications are due by August 1, 2011. The meeting will also host a session of poster presentations. To submit your abstract for consideration, please submit online following the link provided after registration. The status of abstracts will be posted as soon as decisions have been made by the organizers. The deadline for poster submission is August 15, 2011. PDB40, organized by the Worldwide Protein Data Bank (wwPDB), will begin with an evening reception, dinner, and oral session on Friday, October 28th and conclude with lunch on Sunday, October 30, 2011. Early registration is strongly encouraged as the meeting is expected to fill quickly. For complete meeting details, see http://meetings.cshl.edu/meetings/pdb40.shtml. As announced previously, the wwPDB has released PDB Archive Version 4.0. These files follow the PDB Exchange Dictionary v.4.0 and contain the results of remediating complex problems, including the representation of biological assemblies, residual B factors, peptide inhibitors and antibiotics, and entries in nonstandard crystal frames. A description of the review and resulting changes and corrections is available in a PDF document and as a revision log that lists the changes made for each entry (XLS and CSV). For PDB format files, only the entries changed during this remediation have been updated (<17000). These changes are identified as version 3.3 of the PDB file format. All files in PDBx/mmCIF and PDBML/XML formats reflect the new schema updates. Any changes made to the data are recorded in the PDBX_VERSION data category. From July 13, 2011 onward, all new releases and modified entries will follow the updated formats (PDBx/PDBML v 4.0 and PDB File Format 3.3). Revisions to released entries will be tracked and numbered in the PDBx/mmCIF formatted files. Users who maintain local copies of the wwPDB FTP can download the new files via rsync (see Download Archive - Data Download Instructions for more). A time-stamped snapshot of the PDB archive before this release is available from ftp://snapshots.wwpdb.org/. Speaker presentations, poster session, and Early Career Scientist Travel Award applications have been announced. Applications for travel awards are due August 1; poster abstracts are due August 15. Early registration is strongly encouraged as the meeting is expected to fill quickly. For complete meeting details, see http://meetings.cshl.edu/meetings/pdb40.shtml. As announced previously, the wwPDB has performed an ambitious review of the PDB archive resulting in a new set of corrected files that follow the PDB Exchange Dictionary v.4.0. These files will be released on the July 13, 2011. The review involved remediating complex problems, including the representation of biological assemblies, residual B factors, peptide inhibitors and antibiotics, and entries in nonstandard crystal frames. A description of the review and resulting changes and corrections is available (PDF). Versioning and revision logs will be introduced with this release. For PDB format files, only the entries that have been changed during this remediation will be updated (<17000). These changes will be identified as version 3.3 of the PDB file format. All files in PDBx/mmCIF and PDBML/XML formats will be updated to reflect the new schema updates. Any changes made to the data will be recorded in the PDBX_VERSION data category and a revision log made for this release that will be available from the wwPDB FTP site. From July 13, 2011 onward, all new releases and modified entries released will follow the updated formats (PDBx/PDBML v 4.0 and PDB File Format 3.3). Revisions to released entries will be tracked and numbered in the PDBx/mmCIF formatted files. A time-stamped snapshot of the PDB archive before this release will be available from ftp://snapshots.wwpdb.org/. The wwPDB has performed an ambitious review of the PDB archive and has created a new set of corrected files that will be released in Summer 2011. Version 4.0 PDB entries will follow the PDB Exchange Dictionary v.4.0. The entire archive has been reviewed and remediated with the objective of tackling complex problems. These include the representation of biological assemblies, residual B factors, peptide inhibitors and antibiotics, and entries in the nonstandard crystal frame. A description of the review and resulting changes and corrections is available (PDF). Users who maintain local copies of the wwPDB FTP will have to download the entire archive. Scripts to help in this process are available at Download Archive - Data Download Instructions. In October 2011, the Worldwide Protein Data Bank (wwPDB) will host a scientific symposium celebrating the 40th anniversary of the inception of the PDB, and the many scientific contributions it archives. The program will showcase the scientific impact made by structural biology during the past 40 years with a distinguished panel of scientists who have been instrumental in the development of the PDB and structural biology. The meeting will begin with an evening reception and plenary session on Friday, and conclude with lunch on Sunday. For details, please see the meeting website at http://meetings.cshl.edu/meetings/pdb40.shtml. A snapshot of the PDB archive (ftp.wwpdb.org) as of January 3, 2011 has been added to ftp://snapshots.wwpdb.org/. Snapshots have been archived annually since January 2005 to provide readily identifiable data sets for research on the PDB archive. The directory 20110103 includes the 70,231 experimentally-determined coordinate files and related experimental data that were available at that time. Coordinate data are available in PDB, mmCIF, and XML formats. The date and time stamp of each file indicates the last time the file was modified.